It incorporates an open-air viewing gallery, offices for PTI’s, restrooms and storage space for equipment. The Sports Pavilion at Mayor School has two changing rooms for teams and one common room with attached toilets. It also has a pantry and all the facilities are of International standards. The 10 metre air rifle and air pistol shooting range is equipped with three pulleys for practice sessions. Events held on the range include air rifle peep sight, air rifle open sight and air pistol competition shooting. The range has supported the development of beginners at the sport into skilled shooters who have represented Mayoor at state and national level shooting competitions. The basketball courts are ultra modern cushioned arenas with modern lighting systems. Two clay courts for tennis near the Kotah Art School. The practice sessions and competitions for the games of football and hockey are held in two full size and one small- all-grass pitches. The cricket field at Mayoor comprises Rajasthan Cricket Association approved quality turf pitches and full size carpet outfields. Modern swimming complex comprises multiple pool arenas, automatic purification and cleaning systems, change and rest facilities. The artificial Climbing Wall at Mayoor is an enticing and adventure-filled addition to the sports infrastructure. The wall is 30 feet (9.15 meter) tall and 17.6 feet (5.33 meter) wide. The levels of climbing range from beginners to advanced; climbers can use any of the three techniques- Speed climbing, Lead Climbing and Bouldering for an exciting, challenging and mentally stimulating session under expert supervision. The quadrangle situated in the primary block is used as a skating arena. 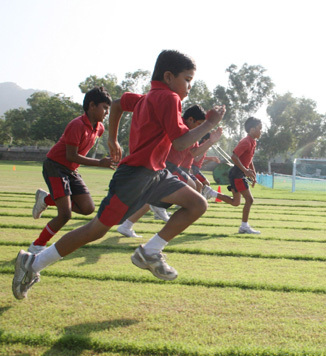 Students are provided training in speed skating and roll ball game. The fully air-conditioned Multi-purpose Hall provides uniform lighting, required ventilation and playing surface for the sport. Table tennis tables are laid during the sporting sessions and related equipment is provided to the players.